Recently, Olivia and Carter were invited to the teach their Plastic Awareness Week curriculum program to the students at the Sophia Academy in Atlanta GA. 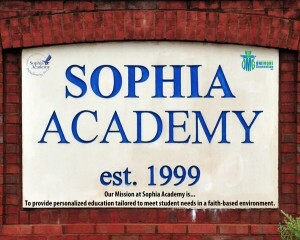 The Sophia Academy sees each child as an individual with unlimited potential if given the opportunities and tailored instruction. With a highly motivated staff and a commitment to each child’s learning style, they provide a premier college prep PreK-9th grade environment. Small class sizes, individual goals, and innovative multi-sensory instruction as guided by the Georgia Performance Standards produce results for all children. 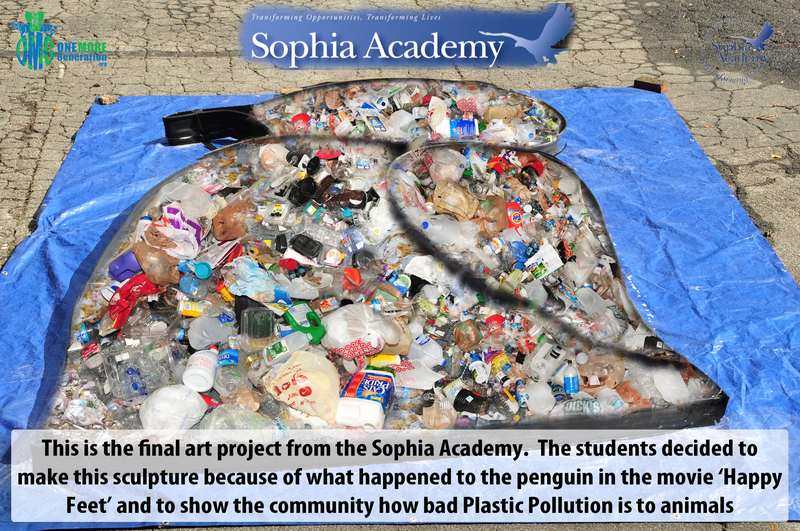 Their comprehensive curriculum which includes music, art, theater, athletics, and Christian education broadens their students’ interests, promotes leadership, develops talents and shapes character which makes the Sophia Academy the perfect fit for sharing our Plastic Awareness Week curriculum. 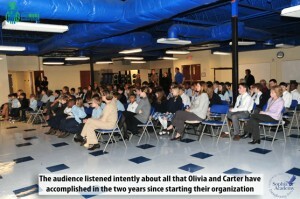 On the first day our two young founders attended the opening ceremonies and even gave a full presentation to the entire student body along with faculty and staff. 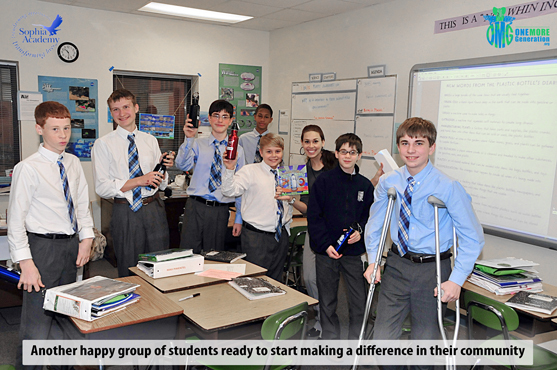 The main message they have for the students is to show everyone that “Anybody Can Make A Difference“. The students always seem to connect with them at these events and they are always motivated to want to get involved with the issue. We always show our OMG Video which allows the students to see what motivated us to start the organization and to also raise the students awareness to the issue of endangered species. 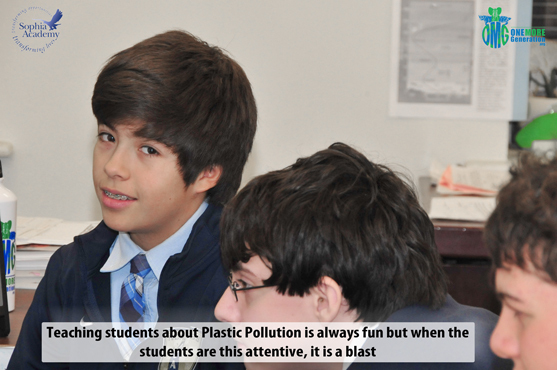 Next, we start out by gauging the students understanding to the issue of plastic pollution and asking them to explain what it means and how plastic pollution has had an impact on their lives. This usually gives us a starting point to introduce the issue and allows us to tailor the program to meet their level of comprehension on the subject. 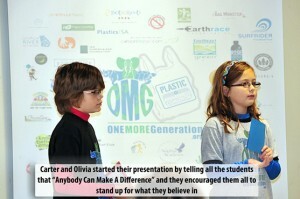 Carter and Olivia share various facts about plastic pollution and also offer a few simple suggestions which each child can immediately implement at home. We give the audience an opportunity to ask questions which is always a lot of fun. Next, the teachers return to their classrooms with their students to begin the first day’s curriculum. Each teacher is provided with an age appropriate environmental ‘read-a-long’ book which they use to help the students understand how plastic bottles are made and the importance of always properly recycling any plastic item they use. The book that most teachers tend to choose for their students on day-1 is “The Adventures of a Plastic Bottle”. 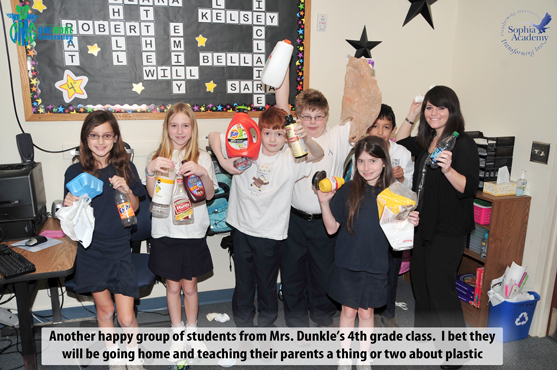 The story appeals to students of all age groups in elementary schools and offers them a fun understanding of how a bottle is made and what happens to the bottle when properly recycled. During the reading sessions, you can really see how engaged the students are. I always love to see their expressions as they learn that plastic is made of petroleum and that there are so many ways to recycle most bottles. 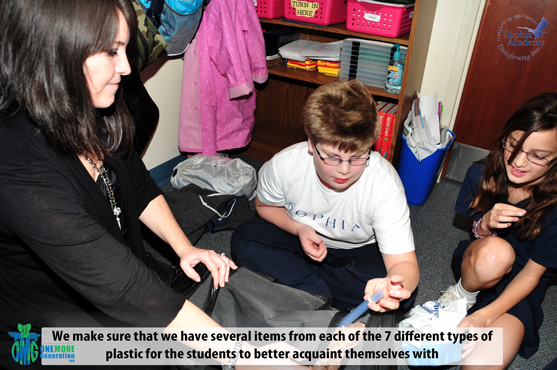 After the reading, we help the students understand how many plastic bottles each person uses per year and allow them to apply their math skills by having them calculate how many bottles their classroom probably generates each year and how many their school contributes as well. Then we discuss the average percentage of bottles which are successfully recycled and have them come up with the estimated number of bottles that may end up in our landfills. The results are usually staggering and always contribute to a healthy discussion about what can be done to improve on the recycle process and or the reduction of bottles being used each day. Next, we then distribute a stainless steel water bottle to each child and teacher in the school which is logoed with their schools logo so they can be used on a regular basis. 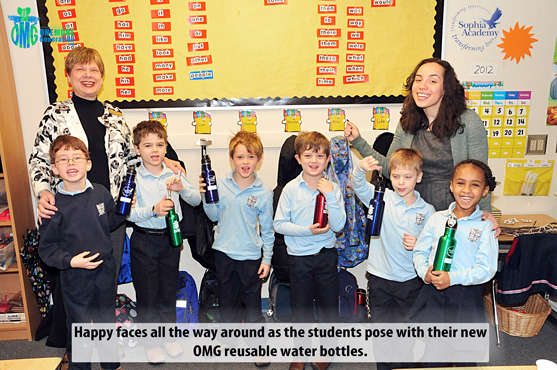 The students love when we do this because they now have a firm understanding of why it is so important to use these as opposed to plastic bottles, or even reusing plastic bottles. The kids also love the fact that they are getting these bottles from Olivia and Carter who are the same age as most of the students, it really helps the students connect with the issue and feel like they can be part of the solution. 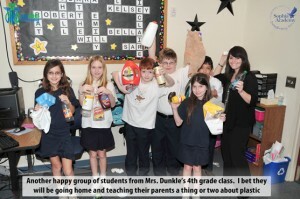 We then remind the students to bring in all their plastic trash from home each day and to place the trash in the plastic trash collection station we helped the school set up. 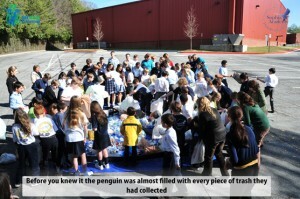 The collection station is usually set up in the front of the school. 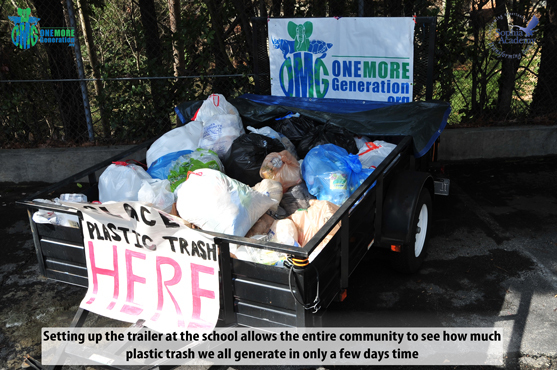 We do this so the students, their parents and even the rest of the community can see how quickly the collection station fills up and how much plastic trash we all generate in such a short period of time. 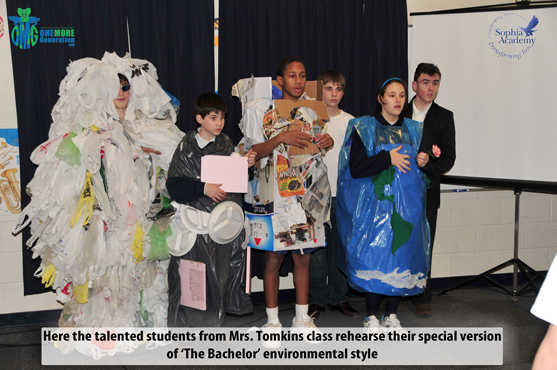 The collected trash will be used on the final day of our Plastic Awareness Week curriculum when the students get to create an art sculpture made entirely from their plastic trash. either had ingested plastic or became entangled in plastic trash in our waterways and landfills. The images are gripping and you can literally see the wide range of emotions each student experiences as we go through each one of the examples. We then ask the students to tell us what could be done differently to ensure that these same problems don’t continue and to explain to us what they can do in their homes to help reduce the amount of plastic pollution. This usually leads to some great discussions which always produces suggestions that are unique and motivating. Next, the teachers take another one of the age-appropriate environmental ‘read-a-long’ books they received as part of our program and proceed to engage each child in a discussion on how single use plastic bags are an item which we can all easily avoid using. 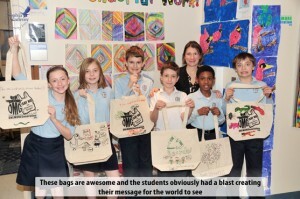 The students learn that although these bags are useful and are generally a great item to recycle, our over-use of these items is causing a major problem to our environment and to many animals all over the world. We then incorporate facts that aid the students geography knowledge by explaining how the oceans are connected and demonstrating how plastic trash discarded here in their hometown, can end up half-way around the world in a whales belly or washed up on shore in the middle of the Pacific Ocean. 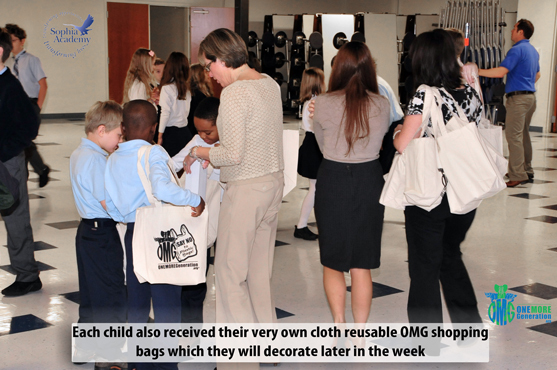 We then hand out a cloth reusable shopping bag to each student and teacher and allow the students to decorate them as they see fit. 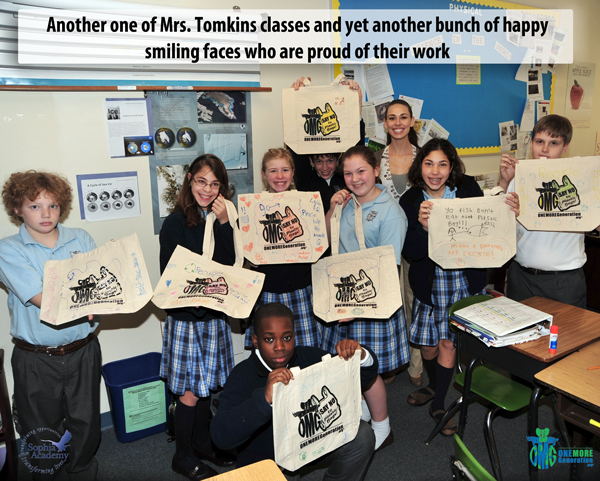 The students always take great pride in decorating their bags and their messages usually depict situations from what they just learned. 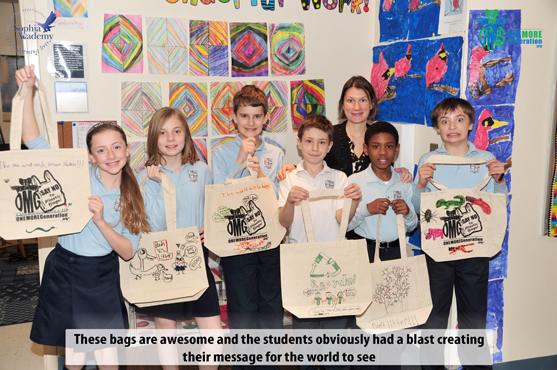 The students are always so proud of their decorated bags and we know that these bags will be taken home and that the parents will now be compelled to use them every time they go shopping. We utilize this third day of teaching to help the students identify the various types of plastics and help them to find the recycle symbol on all types of plastics. We also help them to better understand what can easily be recycled, and which plastics numbers are harder to recycle. 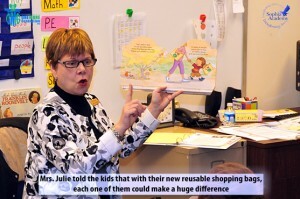 This is one of the areas where we find even the teachers learn from our program. We provide each of the students with a detailed fact sheet entitled “What Do Those Recycled Numbers Mean Anyway” which they get to take home and share with their families. We often get comments back from the parents thanking us for helping them finally understand what it all means. The best way to get kids to learn about the types of plastic is by having actual samples for them to see and touch. 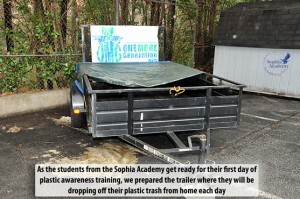 We bring in various items of plastic trash from all the seven different plastic numbers. This allows the students to start to easily identify the type of plastics on some of the more frequently used items they typically will be exposed to. We then help the kids to find a way to memorize a poem or rhyme about the seven recycle numbers which will allow them to aid their parents as they go grocery shopping next time so they can better avoid those plastic types which are harder to recycle. 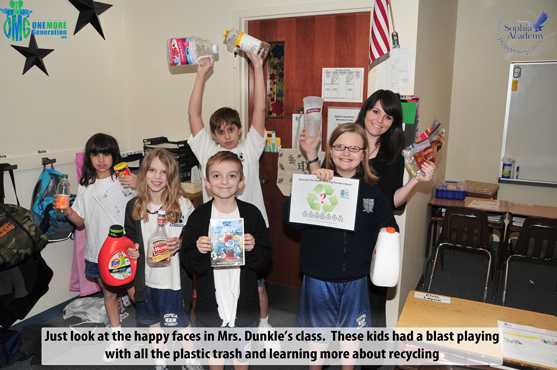 It is always so much fun to watch the facial expressions for the students as they reach into our goodie-bag filled with trash and pull out everyday household items. You know they are always hoping that there will be something fun in the bag instead of trash. Day four is used to allow the students to see first hand how plastic trash affects even them in their school. The students are usually given the opportunity to survey the school grounds so they can see first hand how much trash is actually laying around that they most likely never even noticed. They can also visit different departments within the school to look for areas where plastic is being used on a regular basis such as in the cafeteria and even in their classrooms. 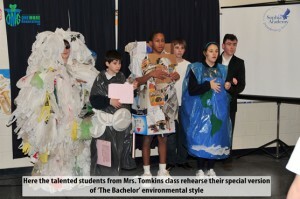 The students are then encouraged to collectively discuss alternatives and to think outside their normal comfort zone as they seek solutions to the over-use of plastic in their schools. We encourage the students to even write pledges that they can share with their fellow students about what they pledge to do that will make a difference and we even have them write letters to their Mayor and local businesses requesting they help the students find ways to help reduce our plastic output. The students are also ready to start discussing what they will make with all the plastic trash they collected and how they can send a message to the community about what all our plastic trash is doing to our environment. 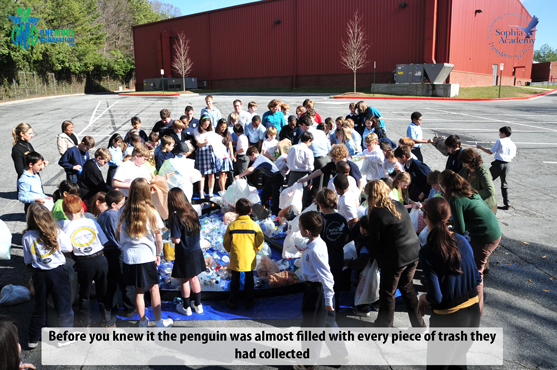 Each school we teach our Plastic Awareness Week curriculum to has a different idea about what to do with all the collected trash but they are all extremely ingenious. 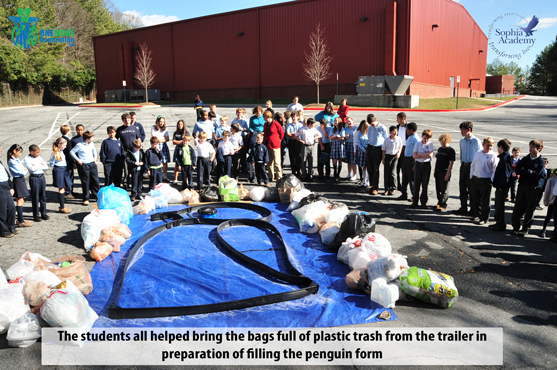 This is probably Olivia and Carter’s favorite day of the event because all the students from the entire school get to gather together along with parents, teachers and the rest of the faculty to create a giant art sculpture made entirely from all the plastic trash they collected. The teaching is done and now is the time to stand back and watch how creative the students can be with all the plastic trash they collected. We first gather everyone out around the plastic trash collection station so they can take in how much trash they generated in such a short period. We often ask the students to tell us a few simple changes that have already made in their families now that they are educated on the subject. I love this part because virtually everyone has already implemented several changes in their homes and helped their parents and friends understand why we all need to be involved in the issue. The students are always anxious for the opportunity to play in all the plastic trash and it always amazes me how much fun they actually have filling their art sculpture with trash. The amount of plastic trash collected by the students at the Sophia Academy was immense but it still only took a few minutes for them to empty the entire trailer full of trash and fill their art sculpture. 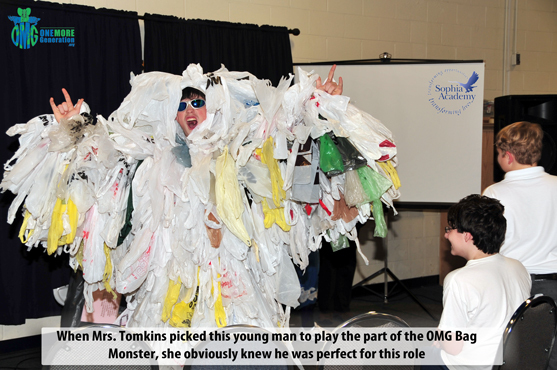 Then, just as they were finishing up their art project, they received a surprise visit from the OMG Bag Monster who is always hanging around wherever plastic trash can be found. 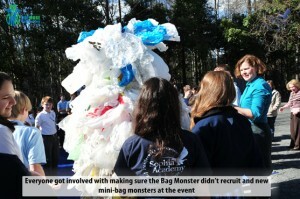 The students were all so excited to see the Bag Monster and everyonewanted to come and say ‘hi’ to him. 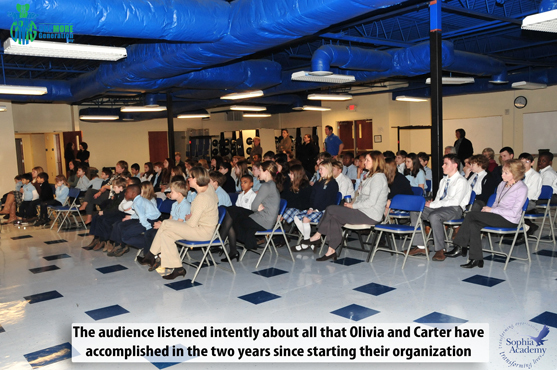 Carter and Olivia made sure everyone knew that the Bag Monster is something that each one of us probably has at home but they also assured the students that he can be defeated and even converted to help communities everywhere find a solution to plastic pollution. After working so hard all week, the students were eager to share their art sculpture with everyone. 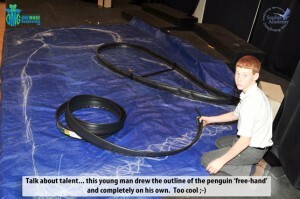 They collectively decided to make a sculpture of a penguin. 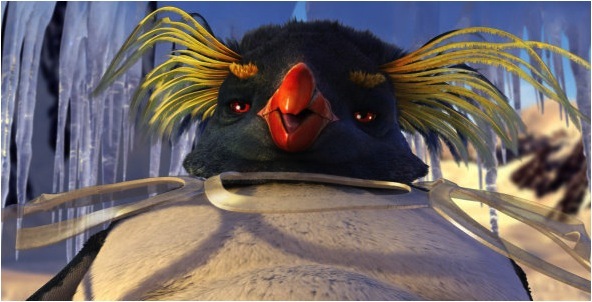 They said that after learning all about plastic pollution, they all remembered the movie ‘Happy Feet’ which depicted a penguin who had a plastic ring stuck around his throat. The students all took turns gathering around Olivia and Carter to have their pictures taken along with the Bag Monster. Each one had kind words to share with us and expressed their gratitude for everything our program had taught them. The best part of the entire week is always the kind comments we get from the students, the teachers and even the parents who all tell us they learned so much and were amazed how easy it is to make small changes in their lives which will have such tremendous outcomes on our environment, and on future generations to come. Here is what the final art sculpture looked like when everything was done. 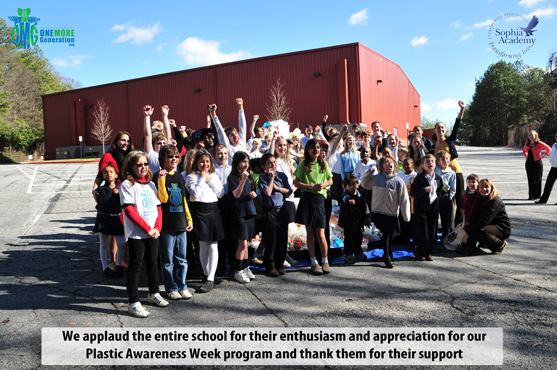 We wish to thank each and every student from the Sophia Academy along with each of the teachers and faculty members for allowing us to come and teach our Plastic Awareness Week program. We are proud to report that the students collected 280-pounds of plastic trash for the week which is by far the most collected by any school so far for our program. 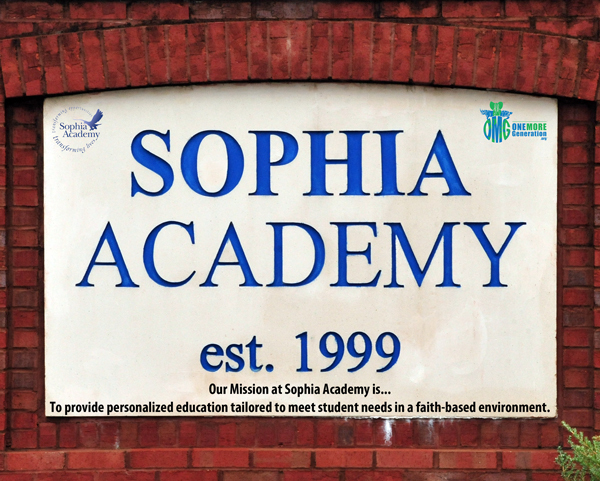 We will be having a follow-up meeting with the staff of the Sophia Academy in the coming weeks to see what effects our program has had on the students and to see what changes the school will be enacting now that they know how plastic pollution harms our environment. 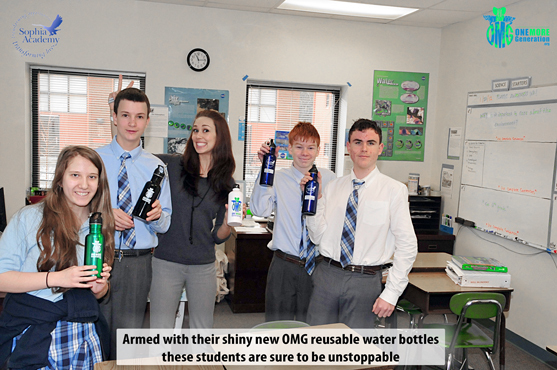 We feel confident the results will be astounding and we look forward to the next school we can partner with on our quest to help raise awareness about plastic pollution.